More flood for less rain. This pithy assessment of the Corps work is from John McPhee’s acclaimed “Atchafalaya” written 27 years ago. It’s still true today because the Corps is still trying to fix the flooding problem by holding the rain instead of speeding its flow to the Gulf. (Mississippi is a holding pond.) Wrong strategy: Contain the River. How: build levees. Result: even more flood for less rain. So why not adopt a Speed the Flow to the Gulf strategy? This logical question was asked back in 1927. But the Contain the River advocates prevailed. The Corps is a massive bureaucracy running a massive government program that’s not working. But hey, what’s new. Can a Speed the Flow strategy work? Yes. Mother Nature has already done most of the work. But there’s powerful opposition to change. On December 29 the Baton Rouge Advocate reported that officials were conferring about opening Mississippi River spillways to minimize flooding in Louisiana. On the same day the Vicksburg Post reported that severe flooding would cause Mississippi’s deer season along the river to close almost a month early. Was flooding worse in Mississippi and did the season close early because the spillways weren’t already open to speed the flow? It looks like it. More flood. Mississippi has had seven major floods in the last nine years. The 2011 flood crest was the highest ever recorded at Natchez and Vicksburg. Flooding is getting worse. It may be due more to the Corps’ containment strategy than Mother Nature. The 2016 flood was the worst January flood ever recorded in Mississippi. Some areas are still flooded. Total property damage won’t be known for months. But the short deer season has spot lighted short term decisions and a strategy that hurts Mississippi farmers and property owners. 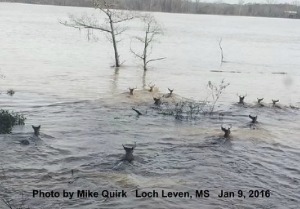 The Mississippi Commission on Wildlife, Fisheries, and Parks closed the season to protect deer fleeing Mississippi River flooding like those in the photograph. They were swimming to high ground about three miles away. Some probably didn’t make it. The stressed survivors in strange habitat were easy prey and needed protection. The commission made a good decision. The Louisiana and federal officials conferring in December made a good decision too for Baton Rouge and New Orleans. But not for Mississippi. The River. When it rains in the Missouri, Ohio, and Mississippi river basins, the water flows downhill. It ends up in the Mississippi River north of Memphis. It meanders south by Tunica, Greenville, Vicksburg, Natchez, Baton Rouge, New Orleans and eventually reaches the Gulf of Mexico. The flat terrain there causes the flow to slow and sediment to fall. The sediments raise the river bed, extend the channel, and slows the flow despite continuous dredging. It takes longer for the water to discharge. Water levels and levees rise. The river gets longer and higher. This causes more floods which deposit more sediments which require more dredging and higher levees. And so on. It’s a constant battle with Mother Nature. Every thousand years or so when the river silts in, it takes a shorter and steeper course to the Gulf. It’s about time. In the 1973 flood the river almost took a shortcut down an old river bed to the Atchafalaya River and then to the Gulf west of Morgan City, Louisiana. It’s about 150 miles shorter and steeper and faster than going by New Orleans. It’s already there to speed water to the Gulf. Gravity will ultimately prevail. Meantime, the Corps tries to delay the inevitable and maintain the existing channel to sustain the city and port of New Orleans and the Baton Rouge-New Orleans petrochemical complex. What if the Corps finessed the inevitable? How? Speed the floods to the Gulf via the shortcut. Contain the flow during low water to maintain the existing channel. The Corps. What does the Corps do now? It dredges, but not enough to speed the flow to the Gulf via the existing channel. It builds more and higher levees to contain the flow. And it builds control structures to relieve the greater floods due to its higher levees. But it rarely opens them and then only to relieve flooding downriver. There are three control structures between Natchez and New Orleans. The Corps operates them to protect Baton Rouge and New Orleans, not to speed the flow to the Gulf or relieve Natchez, Vicksburg, and points upriver. The Old River Control Complex is just south of Natchez. It sits at the juncture of the main channel of the Mississippi and an old river bed connecting to the Atchafalaya River. It blocks the old river bed so that all the flow won’t take the shortcut. It keeps 70% of the flow in the main channel and speeds 30% down the shortcut to the Gulf. The 70-30 split was set in 1954. That was nature’s split at that time. The Corps has changed the river in the 62 years since then, but not the split. Levees and water levels are higher. Flooding is worse at Natchez and Vicksburg. Speeding more flow down the Atchafalaya would relieve this. Why not do it? It takes an Act of Congress. Literally. The river doesn’t need an Act of Congress. It follows the laws of nature (i.e., water runs down hill: the higher the hill, the faster it flows and the greater its force). Mother Nature will change the split and speed the flow to the Gulf if congress doesn’t. She may do more for Mississippi than its senators and congressmen. If the split were 50-50, the main channel would be lower. Flooding upriver would be less severe. And the main channel would be less likely to take the shortcut. It would be even less likely if it were 40-60. And there would be even less flooding upriver. The Morganza spillway is just downriver from old river. It can send about one fourth of the Mississippi’s flow there down its designated floodway to the Gulf near Morgan City. This speeds the flow to the Gulf and causes the main channel to rise slower, crest lower, and fall faster. This has a bigger impact on Baton Rouge and New Orleans immediately downstream than on Natchez and Vicksburg further upriver. But it helps. The designated floodway has farming and recreational activities that have increased since the Morganza was finished in 1954. The Corps owns land and flowage easements in the floodway, but has only flooded it twice in 62 years. Once in 1973 to keep the river from overwhelming the old river structure and changing course. Again in 2011 to relieve New Orleans and Baton Rouge when the floodway was already flooding. It appears the Corps has never considered opening the Morganza to speed the water to the Gulf. Why? Opposition from farming and recreational interests in its floodway? Whatever, it means greater flooding of private land upriver not subject to flooding easements. The third control structure is the Bonnet Carre’ Spillway just north of New Orleans. When it opens, part of the river flows into Lake Pontchartrain and thence to the Gulf. It has been opened many times to protect New Orleans. The faster discharge also shortens floods upriver. River Roulette. Decisions about who to flood involve trade offs. The Morganza floodway or the land above Natchez? The floodway or Baton Rouge/New Orleans? The Corps waits to make the call. It looks like River Roulette. But it’s not. Natchez and points upriver always take the flood bullet. Natchez, Vicksburg, and backwaters were already flooding in December when federal and Louisiana officials conferred about flooding in Louisiana. (There were no reports of federal and Mississippi officials meeting about flooding upriver.) There were more reports of more Corps’ meetings with Louisiana officials (including the outgoing and incoming governors) about opening the spillways. The Bonnet Carret’ was opened January 10. The crest at New Orleans did not exceed flood stage. The Corps announced the imminent opening of the Morganza several times subject to final decision by the commander in Vicksburg. But it was never opened. Vicksburg crested seven feet above flood stage. Natchez, nine feet above. Both were above flood stage for almost a month – while the holding pond slowly drained. There was no flooding in the floodway from the Morganza. How much higher was the flooding at Greenville, Vicksburg, and Natchez due to the decision not to open the Morganaza? How much longer? How much greater was the economic damage? Wildlife losses? What’s fair? Was it fair to spare the designated floodway and increase private property flooding in Mississippi? While the decision was pending, at least one Louisiana state legislator expressed concern about constituents near Morgan City. Did Mississippi legislators know the decision was pending? Did any speak up for constituents near Vicksburg? Natchez? The Delta? It looks like the Mississippi River from Natchez to Memphis and the land between its levees plus the Yazoo and Homochitto basins is now a giant bathtub keeping the designated floodway from flooding. Like it? Yes, if you are farming, hunting or fishing on the Corps floodway. Not so much, if you you have a flooded farm or camp on private land in Mississippi. What to do? Why not change the strategy? Why not speed up the flow to the Gulf? When it starts to flood, why not send more flow down the old river bed to the Gulf before the bathtub fills up? Better yet, why not send more flow before the bathtub ever starts to fill and give some lagniappe to Natchez, Vicksburg and points upriver? Who can get the Corps attention and make this happen? Hello, Mississippi senators, congressmen, governor, and legislators. Who can encourage them? Hello, hunters, farmers, and landowners and the businesses that depend on them. You may or may not be relieved to know it didn’t.